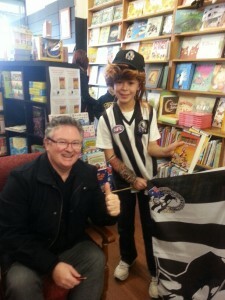 During the holidays I went to The Little Bookroom for a footy event to meet Michael Wagner. He is the author of the Maxx Rumble series. I went dressed as a mad Pies supporter. That’s why I’m wearing a mullet and tatts in the photo! (I came second in the competition to a Geelong supporter). It was exciting to meet Michael Wagner and have my photo taken with him. Michael signed my books “Stacks of Maxx” and “Grand Final Fever”. He told us stories about his childhood. In the future he is going to write soccer and basketball books. Did you know that in the 1980s Michael was also a musician? This entry was posted in Uncategorized and tagged AFL, Authors by smotlrcblog. Bookmark the permalink. What an exciting day for you Nathan. Thanks for sharing it with us. I would recognise your beautiful eyes anywhere even under a mullet. I wonder where you got all the tatts. I really loved reading all about your super day. You look so cool dressed up as a mad Pies supporter with your hair mullet and tatts . If I had the chance to dress up as a mad football supporter it would be the Blues. Thank you Mrs Stewart I really appreciate the comment. Every mad Magpie supporter should have them. You can borrow mine !! I had lots of fun getting dressed up and meeting Michael Wagner. What a great post! Miss Y thanks for letting us know it was on and for taking the time to write up the post with Nathan! Thank you for being a great supporter of the LRC Blog and a wonderful role model for parents in the way you encourage and support Nathan and Chloe with their reading and love of books. I wonder if we could persuade Mrs Stewart to try on your tatts on Footy Day this term? Not a good result for your Pies or my Roos this weekend. I’m not sure which result is worse! Nice post Nathan. I hope he inspired you to one day write books too. 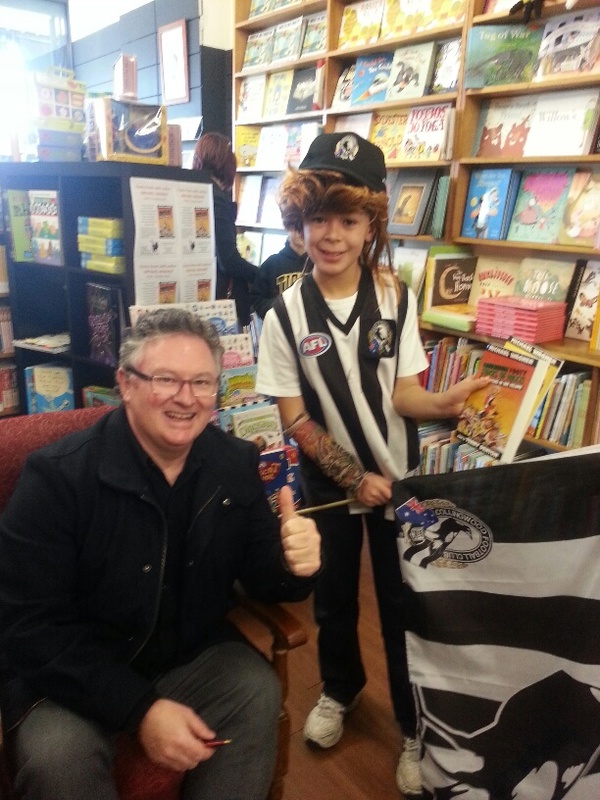 I think lots of children would like to read a book from you about how and why you changed your favourite team from the Pies to the Hawks! Let’s not discuss the AFL results for the Roos and Pies. Thanks for your post. I am never ever going to write a book about changing from the Pies to the Hawks. Thanks Zio !